The undergrad research series is where we feature the research that you’re doing. If you’ve missed the previous installments, you can find them under the “Undergraduate Research” category here. Are you doing an REU this summer? Were you working on an astro research project during this past school year? If you, too, have been working on a project that you want to share, we want to hear from you! Think you’re up to the challenge of describing your research carefully and clearly to a broad audience, in only one paragraph? Then send us a summary of it! You can share what you’re doing by clicking here and using the form provided to submit a brief (fewer than 200 words) write-up of your work. The target audience is one familiar with astrophysics but not necessarily your specific subfield, so write clearly and try to avoid jargon. Feel free to also include either a visual regarding your research or else a photo of yourself. Cormac is entering his final year of high school in Cork, in the south of Ireland. Last summer he completed an internship in the physics department at University College Cork, where he worked on the following research project. Cormac is now the Managing Editor of the Young Scientists Journal and a Research Collaborator with Armagh Observatory working on data mining in the Small Magellanic Cloud in the search for new O-stars. V404 Cygni is a low-mass X-ray binary in the constellation Cygnus. The two stars comprising this system are an accretor (a black hole candidate or neutron star) and a donor star (a low-mass late type star). The accretor grows by accumulating matter from the donor star. Periodic outbursts of X-rays occur as mass is transferred from the donor to the accretor. It underwent a period of outburst this summer, beginning on June 15th 2015. I performed V band photometry on the system in August to attempt to ascertain whether the system had returned to quiescence or not. I used the McDonald 1m telescope in Texas, owned and operated by Las Cumbres Observatory Global Telescope Network. My observation time was awarded to me by the Faulkes Telescope Network. Using the Aperture Photometry Tool, I found the V magnitude on August 12th to be 17.24, which was lower (and thus brighter) than the quiescent V magnitude averaging 18.3-18.4 but higher (and thus dimmer) than the peak V magnitude of 12.1. From the data I obtained, the system appeared to be still active, but was dimmer than when at peak activity. From this, I inferred that activity in V404 Cygni was dissipating but not yet returned to quiescent levels. This work was presented in poster format at both the Irish National Astronomy Meeting 2015 and at the Young Scientists Journal Conference 2015, where it came in 3rd place overall. 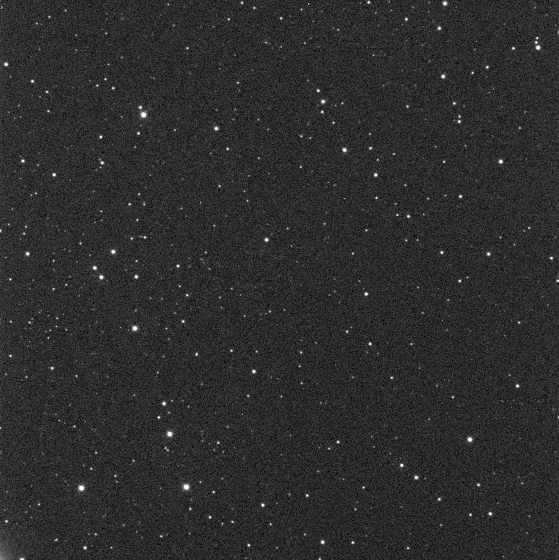 The combined 5×60 second image used to measure the magnitude of V404 Cygni on August 12th 2015. If you’re an undergrad or you know undergrads doing interesting research related to astrophysics, we'd love to hear from you! It can be published or unpublished work — if it’s something you’ve put time and effort into and would like to share with us, we want to see it.